In an election year, are legislators more likely to give you candy or tell you to brush your teeth? Find out next week when the big government housing bailout passes. Obama travels to the Middle East and Europe next week with an all-star media entourage. While it's likely this trip will be Kennedy-esque on the European front (Ich Bin Ein Obama? ), his handlers are probably fretting about the PR perils of the Iraq leg, where photographers lay in wait to capture the "secret Muslim photo" for which the right wing blogosphere hungers. In a prisoner swap, Israel got two corpses in exchange for releasing five Hezbollah guerrillas involved in deadly attacks. There's hell to pay in the coming weeks, if not next week. A recent New York Times survey revealed that race remains a strong factor in voter perceptions of the candidates and social conditions. The candidates will have to work hard to woo voters across racial lines as well as ideological ones, as McCain did this week in his appeal to the NAACP. Expect to hear more about that cad, Brett Favre, whose dalliance with the Vikings is prompting "other woman" charges from Packers management and breaking the hearts of fans everywhere. MoveOn is moving as fast as ever as it marks its 10th birthday, the perfect age for brattiness. May you continue to throw stones through glass windows, young friend. Even our teen-age kids came home talking about the New Yorker's Obama cover, kids who don't yet get political satire and merely found it shocking. Which reinforces our sense that the drawing was more offensive than "funny." All for the sake of a dollar, David Remnick? And most aggravating: The blogosphere and MSM lapped it all up, almost completely avoiding a more serious discussion of Obama's NYT op-ed clarification of his Iraq position. The Queen was not amused. Would we like this mock-up of a National Review cover better? The President was in rare form this week: awake. After sneaking in a bailout of Fannie Mae and Freddie Mac over the weekend, he followed it up by expanding offshore oil drilling. Give the man credit for using what's left of his political capital. Our guess is his next move will be to try to push through the judicial nominees being held up in the Senate. Brit Hume, the most boring man on television, will step down as Fox News' anchor after the election. The big names on Fox News almost never change, mostly due to the network's "what the hell" tolerance of on-air gaffes. North Carolina Senator Liddy Dole tried to be funny this week by getting the big HIV/AIDA relief bill named after the late Jesse Helms. For anyone unaware, Helms long opposed funding HIV/AIDS research and prevention, and was happy to give homophobic reasons why. No one got the joke, but what balls! What chutzpah! Oh, sorry, Liddy, didn't mean to imply you're Jewish. The Brangelina babies have arrived, and bidding among celeb publications for the first photos was hovering around $12 mill when last we checked. That's a hefty price for baby pix. Will the mags really recoup it in extra sales? Ah, well, as long as it's all going to charity. And Alpha Kappa Alpha, the nation's oldest black sorority, founded in 1908 at Howard University, celebrated its 100th Anniversary here in DC this week. Celebrities Jada Pinkett Smith, Phylicia Rashad and Alicia Keys - all sorority girls, who knew? - helped 25,000 of their sisters paint the town pink and green. We missed a few big stories in our last issue, but we've polished the crystal ball. If we miss again, Vivannos for everyone. "What, were you guys asleep last week?" asked one faithful reader. "No Jackson neutering comment, no Phil Graham-there-is-no recession snark?" Ahem. You are perfectly right, dearest one. And the Queen appreciates that you understand our private, mutually-assured-destruction-pact about too much public tattle on other matters. It may be hot outside, but remember: Even snark needs a little sweat. I thought the New Yorker cover was funny, though not outstandingly so. It has upset some people I respect, but the most common explanation I've heard is that while THEY understood the satire, they're concerned that many people who believe in the myths satirized on that cover will regard the cover as an endorsement of those myths, which sounds patronizing to me. Editorial cartoonist Chip Bok of the Akron Beacon Journal captured this in his depiction of a man saying to a woman who is holding the notorious cover, "Of course you and I get the joke. 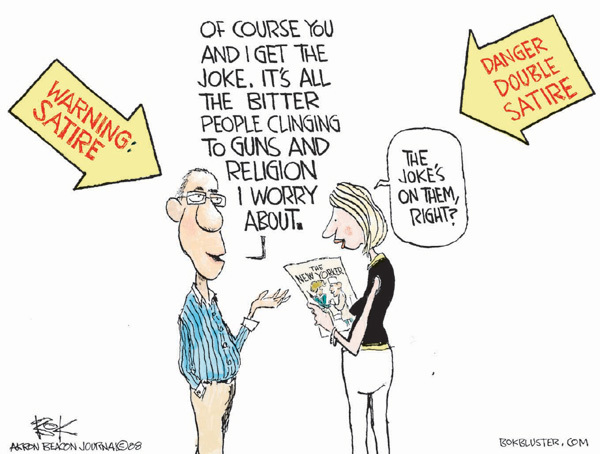 It's all the bitter people clinging to guns and religion I worry about." Jon Stewart had another take on the cover; he suggested that the Obama campaign's response should have been "Barack Obama is in no way upset about the cartoon that depicts him as a Muslim extremist. Because you know who gets upset about cartoons? Muslim extremists! Of which Barack Obama is not." Seems that Stewart is suggesting that the largely liberal American outrage over the New Yorker cartoon echoes the Muslim outrage over a cartoon of the prophet Mohammad published by a Danish newspaper in '05; Guernica editor Joel Whitney explores this comparison further here. The irony in these two uproars, I think, is that the outraged parties have drawn much more attention to the allegedly damaging cartoons than would otherwise have been paid. That's fine with me, because the discussions have got people thinking about communication, satire, and visual images in a way that may have (slightly) increased the general fund of visual literacy and critical thinking skills. It's hard work to instill such competencies in our young, but how dire our future will be if we don't resist our impulse to cater to the perceived lack of such competencies among the general population by suppressing speech that may be misunderstood. In warning against "the dangers of satire in a politically volatile situation," blogger Rune Reimer Christensen implies that such suppression may be necessary for our protection, which I think would itself constitute the true danger to our interests. The best response to speech, whether offensive or otherwise, is more speech and in that respect the flap over the New Yorker cover was a fine thing. I agree with your point "the best response to speech, whether offensive or otherwise, is more speech." But I still find the cover outrageous, and I don't buy the new NYer talking point that the elites are being condescending. That next iteration of their "spin" does just what good defensive messaging is supposed to do -- raises a red herring that becomes part of the conversation rather than actually pursuing the REAL conversation. The NYer cover was about making money, pure and simple. It was horribly offensive, it wasn't funny, it didn't pass the laugh test as satire, but it DOES sell magazines by getting several media cycles jabbering about it. I'd have a lot more respect for them if they'd just say "See? Made you look!" Instead of hiding behind some over-intellectualized fig leaf "You didn't get it!" OR "You're accusing conservatives of being too stupid to get it!" The entire pre-release media campaign and subsequent stoking of the media machine has all been calculated and highly successful. And ALL designed to sell magazines, SPECIFICALLY because it's offensive. So -- I take your point. We all believe in First Amendment rights. The New Yorker can put a photo of dogs copulating on the cover for all I care. But own up to the reason why, don't blame folks if they're offended. Immature and insulting to their faithful readers. I'd have much rather spent last week having the blogosphere and MSM dissecting O's position on Iraq, not this giant manufactured media distraction to sell magazines. Interesting... some critics of the New Yorker's Obama cover argued that had the image appeared on the cover of the National Review (a publication known to be conservative and therefore more likely to embrace the perception of the Obamas satirized in the image), everyone would have agreed it was shameful rather than satirical. I'm not sure I agree, though I think the presence of the title "New Yorker" on the New Yorker cover underscored the satirical nature of the Obama cartoon in a way that the words "National Review" could not have. Now we have an image that depicts negative stereotypes of the conservative McCains, but it appears on a liberal publication rather than a conservative one -- it's the "National Review" scenario made real. So I'm curious to know the reaction of the critics of the New Yorker cover. What do you think? PS. Skip the part about being shocked, shocked that the publishers want to sell magazines (they ain't non-profits). And I'm not so interested in whether your ox was gored (the Obamas and McCains are vilified every day, and it may ever be so in this nation). I want to hear about your moral judgments. First, we're comparing apples and oranges. Vanity Fair didn't actually make that their cover, they just created a viral e-mail campaign. Second -- I'm not sure I have a moral judgment in any of this. I can be shocked and disappointed, but I also understand that magazines want to make money, generate media and actually (heaven forbid) be RELEVANT in a world stampeding to the Internet. And I WANT them to be successful -- I LOVE magazines. I'm just offended by the way the NYer condescended to their readers by saying "either you don't get it, or you think someone else is too stupid to get it" rather than owning up to what they're doing -- selling mags, making people talk, and (frankly) getting them to read a pretty good article about Obama. As for whether the McCain cover is offensive -- that's different than a moral judgment. Of course it's offensive, it's intended to be. Not as offensive as if they'd put it on the real cover. But I argue it's less offensive than the Obama cover for these reasons: McCain actually IS old; Obama is not actually Muslim or a presumed terrorist. Cindy McCain actually DID have a pill problem; Michelle Obama is not a Black Panther. And, for better or worse, agism and drug abuse are less explosive than racism and fear (or exploited fear) of terrorism. I would argue that since the images of McCain and his wife do have some basis in reality, the Vanity Fair e-mail campaign actually is better satire than the NYer cover. Now the cover that would actually be as offensive as the Obama cover would show Hillary and Eleanor Roosevelt in flagrante delicto in the Lincoln bedroom. Hillary is not, actually, a lesbian (but everyone wants to believe she is) -- thus making it more equivalent. And gay civil rights is a burning issue. Not only that, being black, muslim or gay could very well be disqualifiers for the Presidency (we'll see about the first in November), whereas being old or having a pill-head wife are not only NOT disqualifiers, there is a venerable tradition of both.